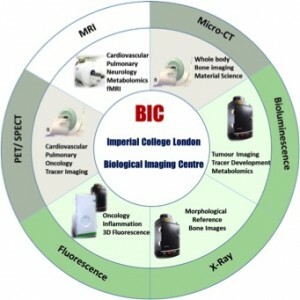 The UK MEDical BIOinformatics partnership programme (UK Med-Bio), led by Prof Paul Elliott and funded by the MRC, brings together a group of leading multidisciplinary teams in medical, chemical, metabolic, statistical and computational sciences from across Imperial College London (lead institution) and its partners. The St. Mary’s FACS Core Facility is housed on the 3rd floor in the Medical School building. The facility is open to everyone and provides access to high-end FACS analysers, teaching and training, performs a dedicated Cat2 cell sorting service, and houses a MSD and a Luminex200 cytokine and protein analysis platform. The cell sorting service usually operates during weekdays but we try to accommodate a certain flexibility in terms of start and end time. Your science matters to us and we’ll live up to this claim. Access to all of our analyser platforms can be organised on a 24/7 basis with college security. As part of our service, the facility provides all necessary reagents (except antibodies and functional dyes) and consumables required to run your samples on perfectly maintained instruments. Training is performed in the facility on our own analysers to enable users to operate the systems independently with high confidence. Training is free and we only charge the hourly cost rate of the analyser. Seminars on FACS analysis and sorting can be requested for small groups or departments. CAT2 Cell sorting is performed in our facility as a full service using our AriaIIIu sorter housed in a CAT2 hood; usually Monday-Friday, but we try to be accommodating if out-of-hours/weekends are necessary. We offer help on experimental design and data interpretation in order to help you reach your research goals more effectively. AriaIIIu in a Cat2 safety hood: 375 or 405/ 488/561/640nm excitation suite coupled with 2or6/2/4/3 detector emission bench. Sorting onto slides, dishes, multi-well plates (max 384well), Eppendorfs, FACS and Falcon tubes. Nozzles sizes 70, 85, and 100um to enable all kind of cell sorts.